Yay! They're in the real world! And so are all the Digimon! This is gonna be awesome! The first half of this episode is all about calming down. Yes, they're in the real world and Myotismon is here to kill the eighth child (and the audience probably knows it's Tai's sister). However, we're going to be here a while, so the first thing we do is mellow out and establish some of the new rules. Rule #1- Months spent in the Digital World barely register as hours in the real world. Tai noted this during his short stint, but attributed it to time travel. He's wrong. There are a lot of interesting ramifications to all that (fanfiction authors have created some incredible material centered around the concept). It's a shame future seasons don't play with it more. 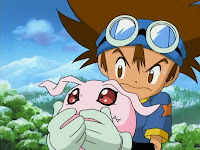 Rule #2- Digimon aren't normal in the real world. Those guys will have to get used to posing as stuffed animals... unless they're huge and causing massive property damage. Then it's okay. Rule #3- Since he's the oldest, adults assume that Joe is responsible and can speak for the entire group. Now we're definitely out of Oz. The humans struggle with rule #1, particularly Mimi who greets her confused camp buddies as if she's never seen them before. 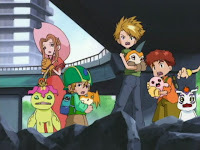 The Digimon struggle with rule #2, especially Palmon who not only has to play stuffed animal, but a stuffed animal Mimi neglects in favor of confused camp buddies. For plot convenience, the summer camp is declared snowed out and everybody boards the bus back to Tokyo. Joe exploits rule #3 to convince their teacher to drop them off at Highton View Terrace, which is where Myotismon is starting out. They never explain how Tai and Izzy know this. All they had to go on was Gennai's overhead map last episode, and that wasn't exactly Google Earth. TK's crocodile tears helped convince the teacher, along with Matt's story about them revisiting the last home they shared as a family. This turns out to be a true story, and a vitally important one: all seven had once lived here. Before they can ponder the meaning of this, Myotismon activates the clause in rule #2 and sends Mammothmon to smash the place up. Birdramon fights it and suddenly everybody remembers a vague little memory from back in the day. You know, the one with the GIANT BIRD fighting the GIANT FIRE-BREATHING MONSTER in the STREETS OF TOKYO. Seriously? They've seen how big Digimon can get. They've seen what kind of damage they can do. They've seen Greymon, and he was one of the combatants! Yet it takes two sorta-similar Digimon fighting here to jog their memories about what had to have been a significant and newsworthy event? That kind of thing could shape someone's entire youth. In fact, it actually did! They quickly realize it was probably the reason they were all chosen as digidestined in the first place. Yet it takes this long for them to recognize their first exposure to Digimon, and initially treat it as if it was deja vu, or maybe the opening part of some disjointed film that felt like three movies attached to each other. Better late than never, I guess. This could easily be my memory playing tricks with me, but Mr. Fujiyama reminds me of that other teacher from Tamers. You know, the one that kept hitting on Kari... er... Miss Asaji. Myotismon actually must avoid the sunlight. Nice to see a vampire actually recognize the traditional weakness... as opposed to making up some way to diminish it. Wow, Gatomon's really going all in with her femme fatale accent. It sounds like she's faking it, but only because she's relishing this whole bad guy gig. Wanna know why everybody loves the Myotismon arc? Myotismon openly says that this eighth child, some innocent kid in Tokyo, “must die.” Not even network sensitivity can stop this from getting real. During Mammothmon's rampage, a row of phone booths and a street car are wiped out, prompting flashbacks to the random items in episodes two and three. I can't imagine any way for those things to travel back in time and actually be the random phone booths and street car, but it does add to the mystique. I can't wait for the refrigerator filled with eggs to show up. am i the only one who thinks that Matt and TK should join some sort of drama club? "Or maybe the opening part of some disjointed film that felt like three movies attached to each other." I love the snark in this blog. Probably even better than Troy Steele, and with a lower volume of jokes at that. It's almost surreal to see the kids go back to the location the series all started at, WITH their Digimon. Just as strange is the confirmation that yes, only a few minutes had passed since they left in real world time, so this is still on the same day we began the series on - August 1. And now they have to either hide their Digimon from other humans or keep them out pretending to be stuffed animals. Worst of all, Myotismon gives no damn about who sees what Digimon out in public - he just wants to find and kill that eighth child! The setup here is just so absorbing and keeps your attention fixated on what will be going on in the show from here on out. I found it great that the freak snow was still in effect at the summer camp, so it had to be shut down, giving our heroes an excuse to take the bus home...or almost home. I also loved watching Gatomon continue to be her cruel, creepy self and seeing Myotismon locate his base in a parking garage was quite funny but makes sense seeing as no light can get to him there. Being in the real world makes his vampiric qualities of not being able to stand light even stronger, so he has to just play the role of behind the scenes mastermind until the sun goes down. Ironically, the major reveals of the episode are it's weakest factor if you hadn't seen or known about the Digimon Adventure pilot movie. And even then the way it's presented is a bit forced, in the same vein as the "we all grew up in the same orphanage but forgot each other due to extensive GF usage!" twist from Final Fantasy VIII. Only Kari still remembers, and I can see six of the kids writing the thing off as a dream, but Tai? He was RIGHT THERE when Agumon digivolved into Greymon and fought Parrotmon - that's not something he should have forgotten. And remembering that it was Greymon who fought Parrotmon due to watching Garudamon fight makes no sense. 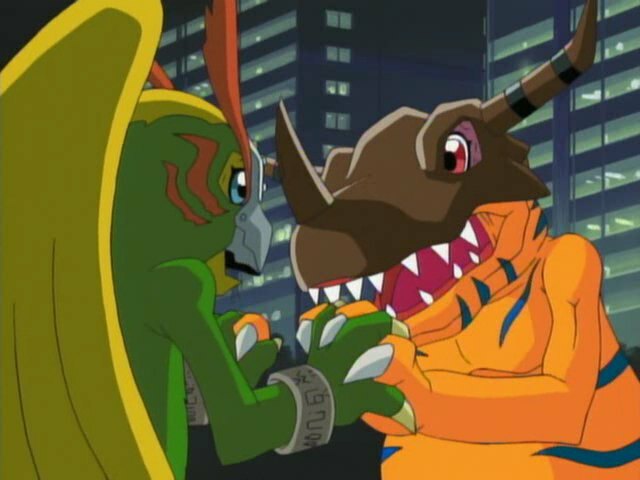 Greymon himself never jolted Tai's memory but THIS did? Really lousy, cheap writing here, but it gets the job done.